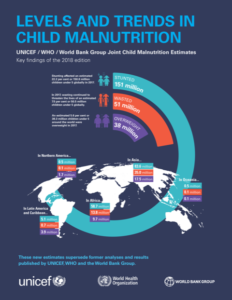 The UNICEF, WHO and the World Bank inter-agency team regularly updates joint global and regional estimates of child malnutrition. These estimates of prevalence and numbers for child stunting, overweight, wasting and severe wasting are derived for the global population as well as by regional groupings of United Nations (UN) regions and sub-regions, Sustainable Development Goals (SDG), UNICEF, WHO and World Bank regions, as well as World Bank income group classifications. The key findings of the 2018 edition presents estimates from 2000-2017; estimates starting from 1990 are available in other resources below.